Fast forward three years, and I'm still writing for the Financial Engines blog and helping with their social media. We've come a long way baby - we managed to add Facebook in January and we've even done Facebook tests to see if we could increase awareness of Financial Engines among their potential customers (the answer is yes we can!). We still can't engage but we've managed to create some momentum. One of the most exciting things that's happened is the Wall Street Journal picked up one of our surveys and reported on the results. Our survey asked people how they felt when they heard the word "retirement." The results were kind of disturbing - but not surprising. It turns out retirement doesn't have a positive connotation. Mostly it makes people feel old. Good information if your marketing a product focused on retirement. Maybe using that word isn't the best idea. This study not only helped us internally, but the WSJ thought it was important to report on because it might be one more reason folks hesitate when it comes to saving for retirement. 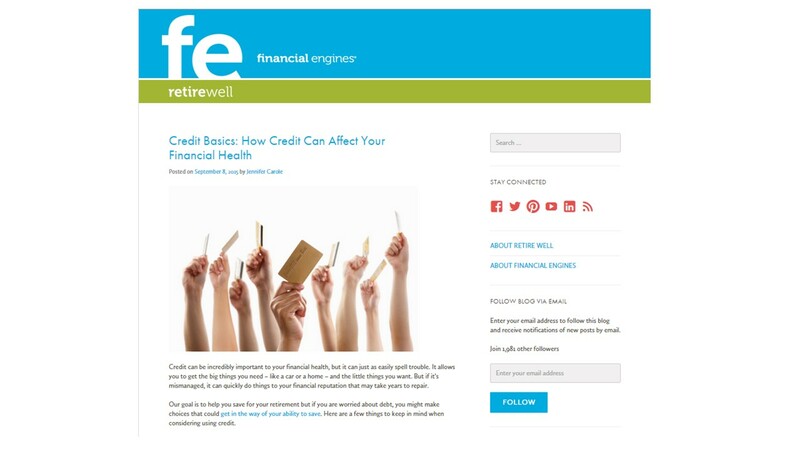 I've written more than 175 blogs about retirement and consumer finance. The style is easy-to-read and hopefully informative. If you'd like to learn more about money and retirement savings, drop by and start reading. And while you can't comment there, you can certainly comment here. I'd love to hear from you. Web Development and web application, for new and already established reputable businesses throughout Thailand, Ireland, Italy, Dubai, UAE, UK, and India.